Instrumental track don’t tend to sell as well as classic vocal songs. There are a few exceptions of course, Acker Bilk’s Stranger on the Shore is one and The Shadows’ Apache is another, in fact, the biggest selling instrumental hit in the UK is Eye Level by the Simon Park Orchestra from 1973 which was the theme to the massively successful Thames television series Van Der Valk with Barry Foster in the lead role. On its initial release in November 1972 it just missed the top 40 but it re-entered the chart 10 months later when the series was in full flow and the track went to number one. This week’s suggestion was a top 10 hit in 1965 and sold an estimated five million copies in Europe within two years. 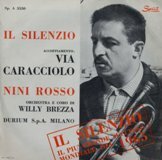 The track is Il Silenzio which was co-written by its performer trumpet player Nini Rosso in collaboration with Guglielmo Brezza. Nini was born Raffaele Celeste Rosso in 19 September 1926 in San Michele Mondovì which is about 50 miles south of Turin. He learned trumpet at school and on completion of his education he chose to play music professionally despite his parents wanting him to attend university. He ran away from home and made his way to Nice in France and began playing in a nightclub. Eventually the police found him and returned him to his parents who now realised he was serious about music so let him continue where he eventually formed a small orchestra and began touring around Europe. He even had a few gigs in India. In 1961, he’d signed a deal with Italy’s Sprint records and the following year released his first single, I Verdi Anni. The flip side of that track was called Concerto Disperato which Rosso had co-written ‎with Silvana Simoni and Angelo Lavagnino and it was covered by Ken Thorne and his Orchestra and became a number four hit in the UK under the title Theme from the Film the Legion’s Last Patrol (Concerto Disperato). Although Rosso is credited with writing the track, its roots go right back to 1880 when Tchaikovsky had used the piece known as the Italian Cavalry bugle call to open his Capriccio Italien, Opus 45. If you’re wondering why a Russian composer came to be singing an Italian bugle call, well I shall tell you, Tchaikovsky was married to Antonina Miliukova but it had gone badly wrong and so he decided to take a holiday, with his brother, in Rome and whilst there he began composing what would be become Capriccio Italien. When released in the summer of 1965 it sold well across Europe making number eight in the UK and top three in Austria, Belgium, Switzerland and the Netherlands but was most successful in Italy where it spent six weeks at number one and in West Germany (as it was then) with five weeks atop the chart selling two million in Germany alone. It also reached number two in Australia. It has had many uses over the years beginning in May 1965 when it was commissioned to be played on the 20th anniversary of the liberation of the Netherlands to mark the end of the occupation by Nazi Germany and has been used every year since to conclude the annual memorial concert. Part of the track was used in all the Italian barracks to mark the end of the day as well as becoming the official anthem of the Slovak football club FC Spartak Trnava being played before every home match. Britain’s most well-known trumpeter, Eddie Calvert covered the track as did the New Orleans jazz trumpeter Al Hirt but neither of them charted. In 2015 a version was recorded by the London Swing Orchestra too. Most recently the Dutch trumpeter, Rik Mol, has recorded a version this year which appears on is album C’est La Vie. Rosso died on a brain tumour in 1994 aged 68.